When you reside near a beach or driving to a somewhat nearby beach is easy, just going there to sit and tan yourself becomes a monotony itself. While there are many different ways of enjoying your time at the beach, you do not always want to go surfing or other riskier more energy-consuming activities. Sometimes (most often) just doing something relaxing yet profitable provides you with a nice escape from reality. Although it is an escape, it still helps you focus your mental energy into one place improving your concentration while providing you with recreation. The activity that helps you do all these is something you may have guessed already. It’s surf fishing. You get a good time away from all your daily hurdles focusing your mind on something completely different. This prepares you for your coming days with a refreshed mind and renewed sharper focus. However, you might find buying a surf rod challenging. It might not even be your first purchase but your purpose might be different. We do not blame you for that but blame the endless kinds of surf rods available in the market. While all of them are not great, most of them do a fair job making it even more difficult to choose. Furthermore, you definitely do not want it to be a luxurious expenditure. So, in order to help you find a surf fishing rod that not only offers you all the necessaries and extras but also comes at a reasonable price, we have something for you. In fact, our buying guide for finding the best surf rods for the money and also the reviews will equip you with everything you need to know about what currently exists. Let’s get our training process started. Are you looking for a rod that will ease your tasks by providing you with the best feel? Then, the Okuma Longitude Surf Graphite rod might be something you are looking for. Apparently, it is part of the longitude series and it lets you choose from a number of lengths ranging from 8 to 12 feet. Therefore, whatever your height is you will find just the right graphite rod for yourself. Yes, it has a blank made of graphite composite which lets provides you with a nice balance between strength and sensibility. However, a few customers did complain about the rod snapping too easily. But, the chances are if you use it for the right species, it won’t snap anytime soon. Apart from the graphite rod, the stainless steel reel seat is a feature you might like too. Apparently, there are EVA cushions above and under the reel seats that will keep it from wearing out too soon. You might find the reel seat a bit too big. However, you can easily fix that by tightening up the reel seat around your reel. The aluminum oxide inserts with double-footed stainless steel coated guide frames are also a nice addition. But, the absence of a protective ring increases the chances of the line tearing up due to the sharp guides. As you may have noticed that this rod does have a few flaws in its construction. However, it performs better than expected when casting compared to other rods from the same range. With cork wrapped non-slip grips, it provides you with a comfortable and powerful grip. Plus, the one-year warranty comes in handy when it comes to its durability. ​​Graphite composite blank makes it both strong and sensitive. ​​Offers a number of lengths to choose from. ​​Efficient and effective rod action. ​​Good quality materials used in the builds. ​​Comfortable and easy to use. ​​​Not considered the most durable as it might snap easily. ​​​Reel seat might seem too big. ​​​The rod might be a bit too stiff for some. Want to feel comfortable while fishing the big fishes with lighter lures without feeling any strain on your arms? Then, Penn Prevail Spinning Fishing rod is another graphite rod that will amaze you with what it does. Apparently, it also has a graphite composite blank that provides you with both strength and sensitivity. In fact, you will be surprised by the strong backbone this rod has. We did not mention big fishes for no reason now, did we? It also features stainless steel guides and aluminum oxide inserts which are great. However, the problem is in the build. Some customers complained about the inserts falling out or the rod missing the whole of them. The reel seat is quite satisfactory as it comes with a stainless steel hood which ensures that the reel will stay in place. Moreover, the rod makes you feel comfortable not only with its lightweight but also its grips. In fact, it features rubber shrink tube grips that help you keep a stronghold even under slippery conditions. Therefore, you can fish for hours without feeling tired or losing control over your rod. Apart from all that, the rod performs really well too. You can choose from a number of lengths and actions which makes the rod versatile enough for any species you want to catch. Furthermore, its lightweight and actions, make it great for long and smooth casts. In conclusion, although you might find a few flaws with the quality or the build, the rod itself performs really well and comes at a very lower price than what it’s worth. ​​​Graphite construction makes it both string and sensitive. ​​​Great for fishing the big species. ​​​​Reel seat with a hood. ​​​​​Available in a number of lengths and actions. ​​​​Inserts might be missing or might fall out after use. If graphite rods do not satisfy you, here is a rod with a carbon fiber core that just might for the price it comes at. Apparently, the Fiblink surf spinning fishing rod has earned both praise and blame for the same feature- it’s strength. While most people who were amazed by the rod had its strength of holding up against big fishes to praise, the others who had something bad to say blamed its poor strength as well. The problem here is probably not with the material or build of the rod. For a rod that is either 10 feet or 12 feet with a good capacity, strength is not something that will make it snap. What you should be aware of is actually its action. Although it has a moderate-fast action, a few customers complained that the rod is quite on the stiff side. While a bit of stiffness can be good for heavy fishing, too much of it will take away the flexibility and lead to snaps. So, if you are alright with the rod being a bit stiff, its strength and the other things will not disappoint you. Everything else about this rod only goes upward. Firstly, the material and build makes it not just very sturdy but also very sensitive. So, you will get the slightest touch by a fish transmitted to your hands in no time! Then, there is the stainless steel mixed with ceramic guides that help you cast smoothly and far. If you receive the guides and inserts, you won’t have to worry about the line being damaged by it at all. The reel seat is very functional and protects the reel well too. Apart from that, holding the rod for hours won’t be a problem thanks to the non-slip rubber shrink tube handle. However, a very few customers said that the rod is not the most lightweight so holding it for hours might be tiring. ​​​Carbon fiber core makes it durable, strong and sensitive. ​​​Vibration is transmitted well to keep you aware of bites. ​​​Good for catching big species. ​​​​Two lengths to choose from. ​​​​Guides or inserts might be missing. ​​​​Might not be as lightweight as you want it to be. You know how people often win lotteries and get things worthier than what they cost? Well, you can be one of those people without taking part in a lottery. In fact, the TICA UGSA Series is a rod that will act as a lottery for you at its price and with the quality it offers. You do not have to depend on your luck to get it or break your bank. Apparently, the number of brand names for each of its parts will leave you thinking that how can a rod so good cost only this much? Let’s get started then. First of all, you know how graphite cores are great but this rod not only has a graphite core but a material core too (See?). Then, if you are worried about the guides and the inserts damaging the line or malfunctioning, FUJI should take good care of that. Then, there is the FUJI DPS ring seat to keep your reel safe and sound. So, this combination makes this rod perform really well. You can cast easily and far and also catch rockfishes really well. The handle is also not a disappoint. It will keep you comfortable for hours; however, the weight of the rod might not. A few customers complained that the rod is quite heavy so that might be an issue. Apart from that, most of these rods are a bit on the longer side. So, if you are looking for shorter lengths, this might not be it. Except for the few cons, this rod is a very efficient rod and worth much more than what it costs. ​​​​Good quality materials used in the build. ​​​​​The guides and ring guides help smooth casting. ​​​​​​Great for catching species like striped bass. ​​​​​​​Offers more than it costs. Are you having a hard time finding the perfect surf rod for yourself? Luckily, the St. Croix Mojo Surf spinning rods increase your chances of finding the perfect rod for yourself. How? It offers you a number of length and action combinations to choose from. This way you will end up with a rod that serves your purpose so well that you will come back to purchase this rod even when the first rod will still be serving you for a lifetime. You do not have to worry about the quality or much else as the brand has been in this game for quite a long time. So, it surely knows its ways. Now, what this rod offers you are pure quality and performance. Firstly, the rod has a premium quality SCII graphite core which provides you with the perfect balance between strength and sensitivity. Furthermore, it has the right amount of stiffness to it as well. Apart from that, it features lightweight guides with zirconium rings. The lightweight will definitely keep you comfortable and the overall constructions ensure that you get to cast without facing any troubles. Line snaps? Line damage? You will face none of it thanks to this rod’s expert design. It is not just great for freshwater but saltwater as well. And, that is exactly what you expect from a surf rod. You can cast far and bring in big fishes easily with this rod. Furthermore, comfortably. Because it features a durable, comfortable and stylish Custom X-Wrap handles to provide you with the greatest control. ​​​​​A good number of length and action combinations available to meet any specifications. ​​​​​Quality builds with great design. ​​​​​​Functional guides that cause no damage. ​​​​​​​Capable of handling big species. ​​​​​​​Strong backbone with the right amount of stiffness. ​​​​​A bit more expensive than others. ​​​​​​The parts may not fit when you are assembling it. 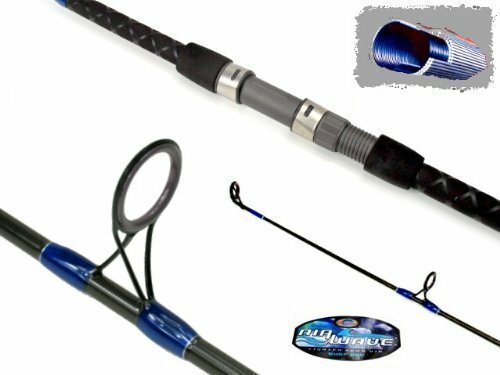 The Hurricane Bluefin is another affordable surf rod that will let you catch fish with the speed and strength of a hurricane! Unlike other rods with graphite or carbon blanks, this one comes with an e glass. This makes the rod extremely strong and durable. Moreover, this also helps to increase the sensitivity. So, you will feel quite good and in control when you fish for those big fishes. It features a number of guiders which serve the purpose well. However, you might receive defected guides that fall out as a few other customers did. As long as you do not receive such a flawed product, you will enjoy your time with this rod. Another great thing about this rod is its handle. The handle is not just comfortable to use but also provides you with a firm grip that lets you feel the control. Although the rod comes in one size (10 feet) only, it serves its purpose really well. With its medium or heavy action, it lets you use 17 to 40 lb lines with 1-6 oz lures. So, this rod provides you with a great feel and quality fishing experience. The problem you might face is with the quality of the build of this rod. As long as the shipping and manufacturing are defect-free, you can expect yourself to be happy with the service this rod provides. ​​​​​​Very responsive to transmitting bite sensations. ​​​​​​​Comfortable, durable and efficient handle. ​​​​​​​​Capable of casting long and smoothly. ​​​​​​​Might have missing parts or parts that fall out. 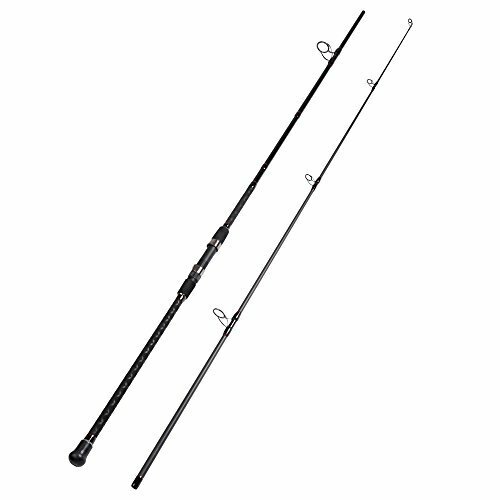 If you want to move up the ladder of the price a bit for greater performance, this Okuma Solaris surfing rod is something you can really take into consideration. Apparently, it also has a graphite blank but an IM-6 graphite one. Not only is it strong and sensitive but also lightweight. You need three things from a rod-durability or quality, performance, and comfort. And, fortunately, this rod is capable of providing you with all these three things. Apart from the graphite blank, the Fuji aluminum oxide guide inserts make it a great rod with which you can cast easily and far as well. In fact, you might feel like you were never able to cast better with other rods. Furthermore, the stainless steel double footed guide frames also protect the guides. So, this clever and well-protected design is what gives the brand the confidence to include a limited lifetime warranty with this rod. They know that this rod is not going to be dying anytime soon. You will feel comfortable using it because of both its lightweight and the grips. It features cork wrapped non-slip rear and fore grips that just provide you with that firm control. One thing you might face a problem with is the stiffness of the rod. It might seem stiffer than you want it to be. In some cases, it might break too although it is well capable of handling a few large species. But, these are rare cases and 80% of the time you get what you pay for and you pay slightly more for this rod. ​​​​​​Strong IM-6 Graphite blank that makes it durable, sensitive and lightweight. ​​​​​​Good quality guides and its frames. ​​​​​​​Might be a bit stiff. 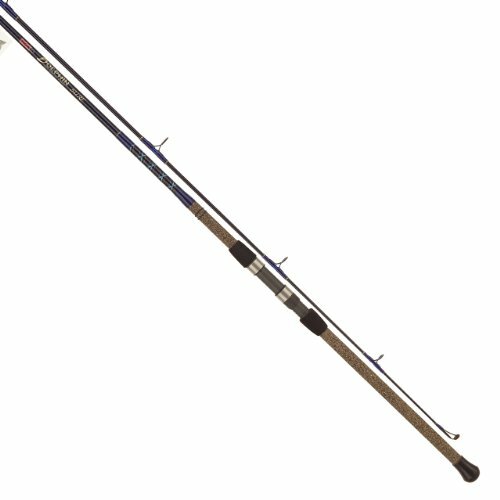 If you like to surf fish while you are traveling then this is just the perfect surf rod for you. In fact, it is a four-piece rod which allows you to easily fit it in the plane storage space over your head. Now, you might think assembling it afterward will be troublesome but it is not. This rod is super easy to not just assemble but dissemble as well. Now, let us talk about the quality. You might think that this rod is so portable; it must fall back on the quality sector. But, it does not. It has SCII graphite blank which is quite durable and sensitive but maybe a bit on the stiffer side. It stills transmits the slightest bite signals to your hands though. Then, there is the two coat slow cure finish to keep your rod resistant to damage by rough sea water. It also features Fuji DPS reel seats with frosted silver hoods which are of great quality. You can go after larger and heavier species as this rod has a great backbone. Furthermore, it allows you to cast really far and that too, quite easily. However, it is not just the performance and quality that will amaze you. This rod, apparently, comes with a nice carry bag for your convenience. Although many customers were not happy with the bag’s quality, it is still a bonus. In conclusion, this rod is a great but slightly expensive rod to have when you are traveling. Although it comes with a bag that’s not the best, it does perform well enough to keep the bad buzz created by the bag away. Also, it offers a 5-year warranty. ​​​​​​​SCII premium graphite blank keeps it durable and sensitive. ​​​​​​​Good quality guides and reel seat. ​​​​​​​​​Resistant to damage with a two-layer finish. ​​​​​​​T​The bag it comes with is not the best. You will be making a lot of mistakes when you just begin to fish with a surf rod. Because of this, you might feel that you are better off with a less expensive trial version of a surf rod so it won’t hurt much if it breaks because of misuse. However, you have to buy one again and the cumulative cost may be much higher than what you would generally spend on a good-quality rod. Therefore, it is best to invest in a good quality, strong rod like the Okuma CSX which is great for beginners. It has a price slightly higher than the other on our list but for good reason. The quality of the rod is great and you will enjoy using it as well. In fact, it might even help you learn faster. The reason, first of all, is its super durable and responsive 30-ton carbon fiber blank. This is way better than IM-6 graphite blanks and will keep you aware of the slightest bites. The smaller inserts are something that can both be an advantage and a disadvantage. While some people may find casting braided lines with it very easy and convenient, others may find it uncomfortable using a smaller than average insert. The durability of each of these parts, however, is unquestionable. Even the rough sea water cannot damage the mighty stainless steel that easily. 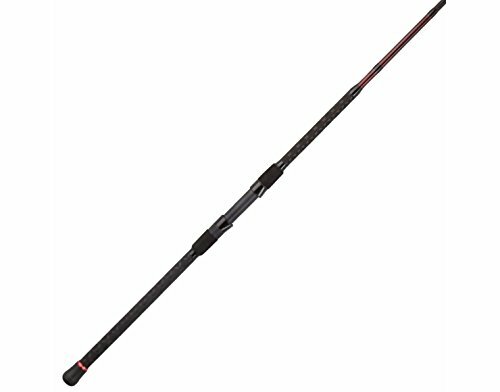 You feel comfortable using this rod not only because it is lightweight but also because it features a really comfortable rubber handle with a rear grip. ​​​​​​​​30-ton carbon fiber blank is very durable and also responsive. ​​​​​​​​The guides and inserts support casts with braided lines. ​​​​​​​​Casts far and really easily. ​​​​​​​​​Great quality materials used in the builds. ​​​​​​​​​​A bit pricier than others. If the waiting phase of fishing irritates you mentally, it will get worse if you are irritated physically. Holding a heavy rod for hours to fish can be very tiring. Therefore, in order to keep physical irritation away from you, Tsunami Airwave has made this rod super lightweight so your hands never get tired. It is not just the blanks that are lightweight but each and every part of this rod has been constructed with lightweight materials to serve the purpose. In fact, it has High-Fiber density blank with Alconite guides. You might think that the lightweight will make this rod weak. However, it can in no way be considered weak. Although the materials are lightweight, they have great strength and also responsiveness. You will not only be able to easily use lines of weights 12-20 lbs but also with a lure weight of 5/8-3 oz. The length of the rod is 8 feet so it is more of an average length. Anyone may feel comfortable using it. It has a cork handle with textured vinyl grips which not only make it comfortable but lightweight as well. For the cost, this rod offers you a good distance for casting and also accuracy with it. ​​​​​​​​​The high-fiber density blank provides the rod with both strength and responsiveness. ​​​​​​​​​Capable of bringing in species easily without breaking despite the lightweight. ​​​​​​​​​​​Good casting distance and accuracy. ​​​​​​​​​​​The price may be a bit higher than the average price on our list. ​1. What Are You Fishing For? Do you ever try to lift up 150 kg of weight with your bare hands? No (If you are an average person). Why? Because you will break yourself in two. Similarly, the size, weight and also the nature of the species you plan to conquer are important to consider. In fact, the first thing you find out is the kind of species you will be catching. If you do not know their specific characteristics and requirements, there is a high chance you will just lose your rod along with your catch. Therefore, first decide the species you are after. Is it life bait, panfish, bass, or some other species? This will make your choosing the best rod process easier quite soon. While this may not seem important, it becomes important to know the determinants that will help you choose the rod length. You might think you will be comfortable with a rod of any length or the longer the rod the better. However, when you see rods ranging from 4 feet to 15 feet, you will end up making the wrong choice in a haste without any knowledge of how to choose. Apparently, the first thing you should consider is your own height and strength. Even if you consider longer rods better if you cannot even handle them, they are not of any use, right? Therefore, first consider what you can handle so that you are comfortable enough to perform at your best. Secondly, the casting distance varies with the length of the rods. If you want to cast far with a heavier lure, longer rods are better. However, do not choose a length outside your comfort zone. Just choose the maximum length that you are comfortable with. Similarly, if you want to cast closer with lures that weight lighter then shorter rods are the way to go. Therefore, choose the length based on these and you will have the rod that makes you feel perfectly ready for an adventure. If you plan to fish all day, the rod will seem to get heavier with time. Therefore, lighter the rod the better. However, it should not be so light that it does not even feel like a rod. Moreover, if you are planning to cast with lures, lighter rods are still better. You can choose rods that have a weight below fifty pounds for lure casting. This will serve both the purpose of casting lures and keeping you comfortable while you cast lure well. ​4. What Material Is The Rod Made Of? What’s the difference between a plastic and a metal gun? The material, of course. And, you can see how much they vary in action just based on that. Therefore, it is an obvious consideration. If you want your rod to stay alive through the rough adventures in the seashores, you must make sure it is made of materials that can handle the strain. Apparently, graphite rods or rods made of fiberglass serve the purpose of rods well. The material highly affects the sensitivity and durability of the rods. However, it also depends on your personal preference about which material makes you feel more in control. Apart from that, another thing to consider is the corrosion resistance. As you will be fishing in sea water, the water will be salty. Moreover, the rocky and rough bottoms will expose your rods to a tough situation. Therefore, you must make sure that your rods won’t falter in front of these obstacles. 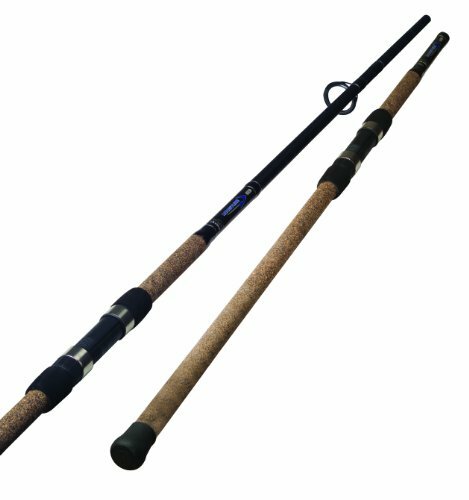 In general, surf rods have a design that promotes more sensitivity and creates vibrations that distribute the strain to resist damage. Apart from these, you should also look for rods with coatings that resist damage from saltwater. Apparently, the spine is the strongest portion of the rod and if you do not make sure the spine is strong, the other parts will not be very strong, will it? Therefore, check that the spine of the rod actually provides you with the strength you need. Apparently, ceramic liners are another consideration for the safety and durability of the rod. In fact, ceramic liners help to reduce the wear and tear on the lines. Since your rod will already be exposed to tough situations, it is best to ensure that each part of the rod gets maximum protection. You can consider a straight metal guide as well because it will also prevent damage to the rod. As you can guess, the material and type of grip your rod should have depends on your preference. You should choose a grip material that makes you feel comfortable and in full control. There are foam and cork grips to choose from. However, you should choose a lighter weight one as it will prevent fatigue. Remember that we asked you to keep in mind the type of species you will be after? The rod action plays an important role when it comes to the type of species you will be after. So, rod actions range from ultra-light action to heavy duty ones. What the ultra light-action does is it bends throughout the whole length of the rod. Similarly, as we move towards heavier actions, the rod starts bending from a shorter distance from the tip of the rod. So, when the rod has a heavy action, it bends only at the tip of the rod. What you need to keep in mind is that it is best to use lighter actions for the smaller species of fishes like panfish, etc. Similarly, as you go after the larger species, gradually move from medium to heavier actions with the increase in sizes. However, it is best to choose from medium to heavier action rods for surf fishing. In fact, the reel is something you probably have to buy separately but it is an important consideration as it will affect the overall feel and performance of the rod. Apparently, you need to find the soul reel of the perfect size and function to fit your rod. It is not very easy to find the perfect reel without actually performing a testing cast. Therefore, it is best if you try out the combination for testing at least for once. Another thing you need to consider is the reel seats. Now, even the best reel won’t serve your purpose well if it does not stay with your rod. How will it stay? With the help of the reel seats of course. So, make sure that the reel seat does not have any part that is loose or might make the reel fall off. It should be made from a good corrosion resistant material to provide the best performance. I think, this buying guides on best surf rods for the money to help you for purchasing a right surf rod. Fishing is definitely a better form of recreation so having a rod close to your hand is great for going on sudden fishing adventures. However, the recreation gets even much better when you fish from the shore. Waves are refreshing and feeling the waves against your feet while you fish can not just refresh you mentally but help you focus better. Therefore, a surf rod specifically designed for fishing in seawater contributes to this factor. 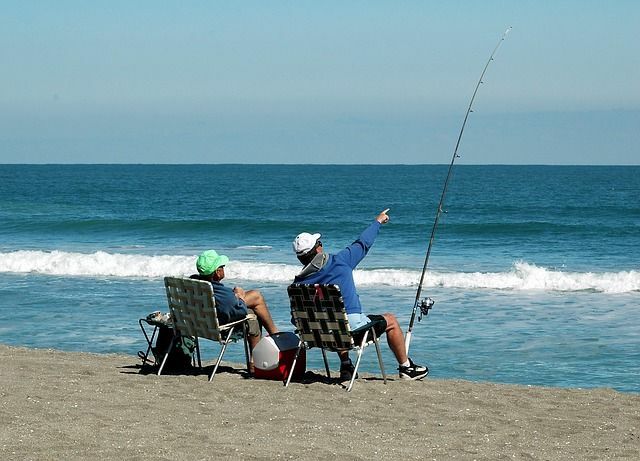 You will need to cover longer distance when you fish in seawater. Therefore, the surf rods are made longer than other rods. This helps you gain distance while casting easily. Although the surf rods are longer, they are made lighter in weight. This helps you be comfortable while you surf fish. Sea water with all its salt and other materials is a bit harsh on rods. Therefore, the corrosion caused by it is also more. But, surf rods are made with high corrosion resistant materials so the sea water cannot cause much harm to the rods. ​Q. 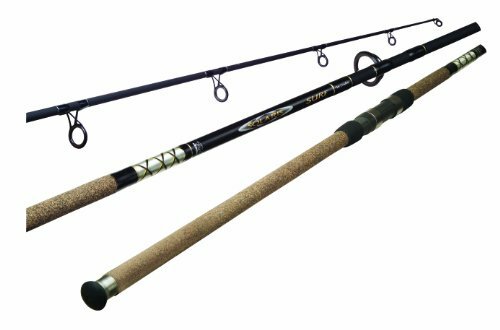 What Is The Difference Between Surf Rods And Other Fishing Rods? Answer: The basic difference, as you already know, is the location where you will be using the rod. Surf rods are generally used when you are fishing from the shoreline and others are used in lakes and elsewhere. When you fish from the shoreline, you have to cover quite a distance and also face large waves. For these reasons, surf rods are longer in length than other rods and also have a design that allows them to cover distance faster. Apart from that, they are more corrosion resistant than usual rods as they have to deal with the rough saltwater. Surf fishing is a more aggressive form of fishing for the daring. When you are prepared with all your skills and knowledge but your weapon is not, it could turn into a disaster. Rather than being a medium for refreshment, it could add to your daily dose of disappointments. Therefore, it is necessary you choose your weapon wisely. But, choosing is a daunting task and you need to be aware throughout the whole process. Especially, if you are on a budget. But, your budget will not stop you from being delighted by your surf rod if you only consider the right things when choosing. Therefore, keep the influential factors in mind while you are out there searching for the best surf rods for the money.